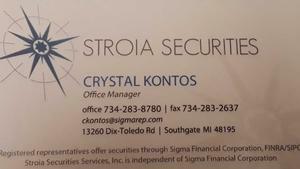 Crystal Kontos : Stroia Securites Services, Inc. Crystal is an Alumni of Oakland University with her Bachelor's degree in Marketing Communications. She is the Marketing Manager and also assists in the day-to-day management of the office. She is in charge of scheduling meetings, events, seminars, and engaging with clients daily to maintain great client / Advisor relationships. She also keeps the advisors organized and efficient while continuing her education.